The Greenwich and Docklands International Festival happens at Greenwich and in the Docklands. Mostly outdoor arts, theatre, dance and family friendly entertainment. The big majority of the events are free and take place at different site in the area. Backyard Cinema @ London Fields Brewery. Weekend movie festival with an ecletic selection like Wrek it Ralph, Indiana Jones and The Temple of Doom and Silver Linings. Live music, DJ sets, food stalls and craft beers brewed at the London Fields Brewery complement this event that kicks off from 12PM. Starts the Spitalfields Music Summer Festival @ various venues across Tower Hamlets. For two weeks a mix of opera, classical, world music and folk concerts will happen all over this Borough. The festival will take place in unusual venues such as churches, quirky cafes and markets. Check the official website for all the programme, tickets start from £5. The London Sketchfest 2013 @ the Victorian vaults. Another edition of the annual festival that showcases and celebrates the best of British sketch comedy. Happens from 6 PM and tickets are £12. Tom du Croz and Nia Charpentier talk to Mike O’ Shea in the Shoreditch radio studio about the second Canalival event he’s co- organising on Regents Canal on Saturday 1st June. Just think floating rubber dinghy mayhem with a pumping sound-system. 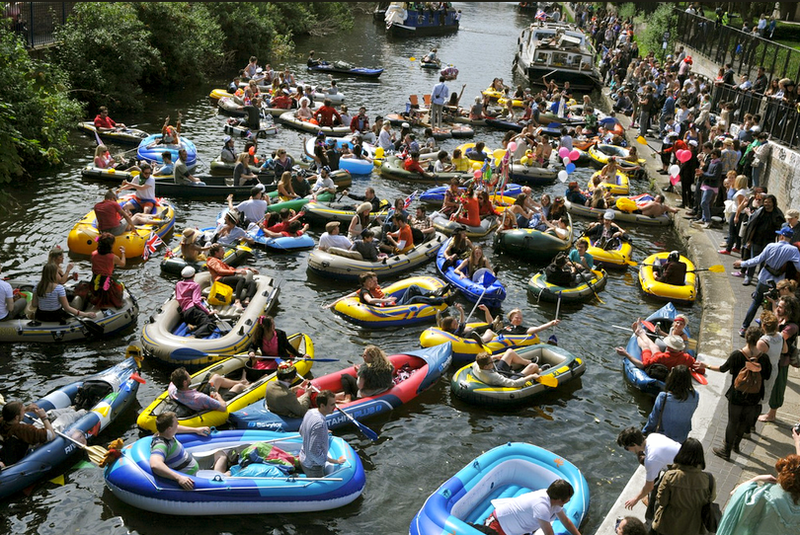 If you fancy taking part just get your day inflatable boat license here for £4! Sound Tracks is an inner-city music festival with a difference. Travel to gigs up and down the East London Overland line and be entertained by bands in the train! We spoke to organiser Amanda Lwin to find out how they came up with the concept. Argentine Film Festival @ Hackney Picturehouse. Screening of five short films from some of Argentina’s best directors. From 4 PM and tickets start at £5.50.